This post may contain affiliate links, including Amazon.com. Read my full disclosure statement here. This post is the sixth in a series on hospitality. Begin the series here. 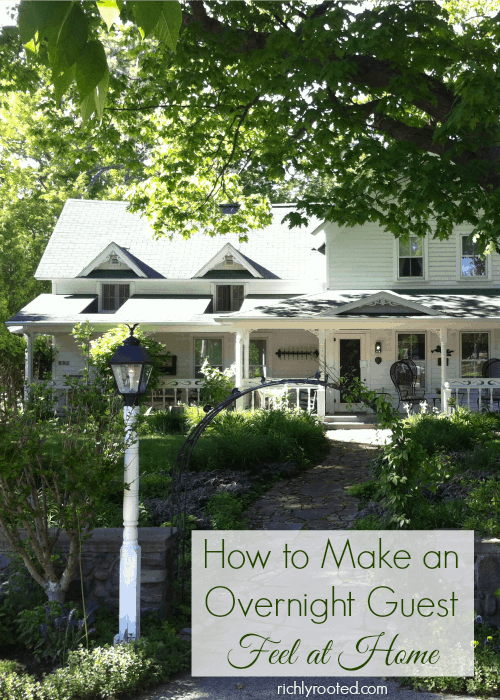 Do you get many opportunities to host guests for overnight stays? I love having guests stay over, usually even more than having them over for just a meal! When you host guests for a longer stay, you get to know them better. After initial small talk or “catching up time” over a meal, you have more time to build the relationship over games, dessert (that’s important! ), or late-night talks. In the morning and at breakfast (also important), you get to know them even better because they’ve had the chance to settle in and start feeling at home. 1. Anticipate your guests’ needs. Think about what you might need if you were in their place. In fact, I once heard the suggestion to stay in your own guest room for a night to see if it’s lacking anything. Show guests where they can help themselves to drinking water or snacks. Provide them with towels, show them how to work the shower, etc. 2. Suggest some activities they can do during their stay. Tell them where they can go for a walk, or introduce them to a historical site. Give them easy access to the internet or a computer so they can check their email. 3. Make their bedroom comfortable. I don’t know about you, but I like my room dark at night. The darker the better. Put up curtains if need be in your guests’ sleeping area. Beside the bed (or couch, if your set-up is like ours!) put a flashlight, extra blanket, electric fan, alarm clock, tissue box, etc. Make sure the bathroom has shower accessories, hair dryer, and a trash can. 4. Provide a good breakfast in the morning. (See my menu suggestions from last week’s post.) Have coffee or tea available! What other ways can you think of to lavish hospitality on your overnight guests? What am I missing from this list? Part 2: Why Practice Hospitality? You will find a whole chapter devoted to hospitality in my cookbook, Real Food for the Real Homemaker! 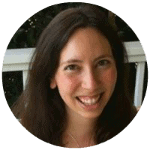 I also recommend the A Heart for Hospitality video eCourse! It has lots of practical information and how-tos, as well as gorgeous printables! Access the course HERE. These are great tips. We do a decent amount of hosting overnight guests for ministry, and it used to make me terribly nervous! I’m little by little learning that it truly is our heart towards our guests that makes them the most comfortable, and our accommodations for them come after that. Hospitality is a lost art. I hope to continue to get better with it! You’re right about that–have your heart in the right spot, and the details will flow more naturally. Thanks for commenting! I love giving overnight guests a “guest basket”. I fill it with toiletries, shower needs, and a book I think they’ll like or a bible. Often times I add a few extra trinkets but I try to tailor it to each guest. Great idea! I think my mom does that! It’s a really special way to let guests know that you’re thinking of THEM, specifically. Can I just say I wish the house on the cover photo was my own? It’s lovely! Your suggestions are wonderful as well. My name is Elsie and I’m glad you’re here! This blog explores what it means to live deeply in the everyday aspects of homemaking. Click here to learn more, and go here to subscribe (and get a free eBook!). FREE Tidy Home Cheat Sheet! 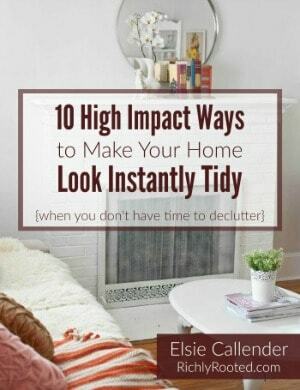 No time to declutter?Subscribe to my newsletter and get my list of 10 high impact ways to make your home look instantly tidy.